Reepham is one of those fine, tiny Norfolk towns that must once have been fiercely independent, in the days before there were commuters, and before shoppers could easily drive to the nearest edge-of-the-city supermarket. It has two churches in its churchyard, one hiding behind the other. Once there were three - the remains of the third are still apparent and easily found. Reepham's three-in-one churchyard is very central, overlooking the little market place. How did it come to be home to three churches? Churches sharing churchyards is not that uncommon; there are at least a dozen examples in East Anglia, and there were once more. To understand why, we need to consider the difference between a parish and its town or village; we also need to consider the medieval functions of a parish church. The English parish system is ancient, dating back to Saxon times. In East Anglia more than in most regions, the ecclesiastical parishes pretty much reflect what was there a thousand years ago, apart from the tidying up and rationalisation that have occured from time to time. Parishes are areas of land, most commonly about ten square miles, and they share contiguous borders - that is to say, there are no gaps between them. It is always possible to step from one parish into another. Everywhere in England is within a Church of England parish. The great majority of parishes contain a single large settlement within their boundaries, which shares the parish name. To look at them on a map, you could be fooled into thinking that the parish has grown up around the settlement; but of course, this is not the case. Settlements occur naturally and organically over the centuries, almost always for economic reasons. Some parishes have more than one significant settlement, and very occasionally the largest settlement does not share the name of the parish. Above all, a medieval church is a parish church, not a village church. 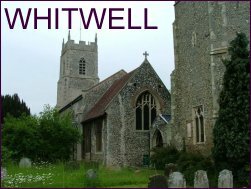 It just so happens that most of them are in the main settlement of the parish; but in Norfolk and Suffolk more than in most places, a significant minority are outside the village of their parish name. And while we may assume that the settlement will be near the middle of the parish, there are plenty of examples where this is not the case at all. Often, it will be towards the edge; sometimes, the main settlements in two adjacent parishes will be joined on to each other, and when this happens it may have been found convenient in ancient times for the two parish churches to share consecrated ground. 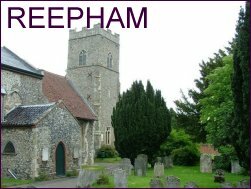 On a rare occasion, the settlements of three parishes may be adjacent - and this is what happened at Reepham. The three churches here were all hard against their parish boundaries, although not actually joined on to each other. You might think this would make the holding of concurrent services awkward, but we need to remember that, at the time they were built, they were not used for 'services' in the way that we would understand the word to day. After all, they were not built as Anglican churches at all, but as Catholic churches, and at a time when congregational, corporate worship was a minor part of the life of the Church, if it existed at all. As I explored on the introduction to Cawston and Salle, a church building was designed to allow private devotions, the administration of sacraments, Masses to be said at different altars by different priests, and so on. Worship was active and communitarian, rather than passive and congregational. Medieval churches were busy places, and this would be the case whether or not all these activities were happening in a single building or in two, or even three. It was only after the Reformation, with the advent of divine service at prescribed times, that churches sharing churchyards became problematic. If they also shared a Rector (as increasingly happened) then it made good sense to take down one building and just use the other. Hackford church's demise is attributed to a fire in 1546, but this date looks suspiciously similar to that of the many examples of churches derelicted by the protestant reformers. Most often, churches served by monasteries were taken down and cannibalised for their building materials. 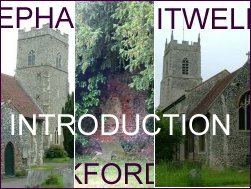 We know that masonry from Hackford church was used in the expansion of Whitwell church. 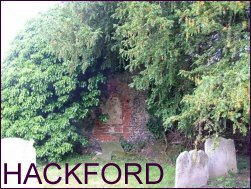 So Hackford church was lost; but the two other buildings underwent all the considerable changes that the protestant Reformation and the subsequent years of conflict could bring. When the Church of England entered its century of torpor in the 1700s they probably settled down with a quiet sigh of relief, but the 19th century Anglican revival brought new challenges and changes, and both churches underwent major restorations and rebuildings. The two surviving churches remained in separate parishes up into the 1930s, but this was increasingly an anomaly, and it was probably only the revival that allowed them to sustain this for so long. In 1970, Whitwell church was at last declared redundant, and became the parish hall; a happy outcome for the town, and in reality no more than just another reinvention of this once-medieval building.